Heeft u een vraag voor Alcoves Apartments Aguirre - Radissons Units? Alcoves Apartments Aguirre - Radissons Units, gebouwd in 2002, is een aanwinst voor Manila en een slimme keuze voor reizigers. Het hotel ligt niet zo ver van het stadscentrum: de afstand is ongeveer 9.8 km en het duurt normaal ongeveer 18 minuten om het vliegveld te bereiken. Dankzij de praktische locatie liggen alle belangrijke trekpleisters in de buurt van het hotel. Het Alcoves Apartments Aguirre - Radissons Units biedt gasten superieure dienstverlening plus een breed scala aan voorzieningen en is toegewijd om uw verblijf zo comfortabel als mogelijk te maken. Het hotel heeft een uitgebreid aanbod aan services, inclusief gratis wi-fi in alle kamers, snel in- en uitchecken, vervoer van/naar luchthaven, lift, kluisjes. Treed binnen in één van de 2 uitnodigende kamers en ontvlucht de dagelijkse stress met een breed scala aan voorzieningen, zoals plasma tv, handdoeken, internet (draadloos), draadloos internet (gratis), rookvrije kamers. Daarnaast garanderen de talrijke recreatieve mogelijkheden dat u zich tijdens uw verblijf kunt vermaken in het hotel. Met een ideale locatie en bijpassende faciliteiten, is het Alcoves Apartments Aguirre - Radissons Units voor veel gasten precies wat zij zoeken. 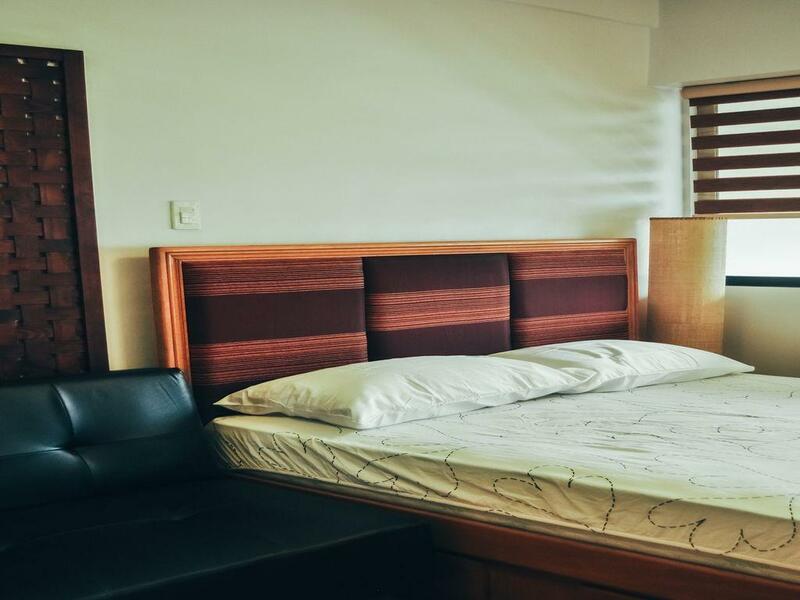 De accommodatie is geen hotel en verhuurt alleen losstaande appartementen. Indien een gast bij de accommodatie boekt, wordt verzocht om d.m.v. het veld 'Speciaal verzoek' een geschatte aankomsttijd, een regelmatig bekeken e-mailadres en een telefoonnummer door te geven. Gasten worden verzocht om e-mails te beantwoorden. De accommodatie heeft deze informatie nodig om de gast bij de appartementen te kunnen ontmoeten. Schoonmaak wordt elke 2 dagen gedaan. Did not really have high expectations coming in. But then again, the property did have the "Radissons" name on it so i kept an open mind. Check in was a breeze and somebody was at the room to meet me and gave me instructions on the key lock. The room was with a mini kitchen which came with all the necessary utensils for cooking. A+ for me as i prefer to prepare my own food and reheat. Wifi was available as well. Theres a pool but did not get a chance to try it. and oh, if you dont like to cook, the property is walking distance to a mall where youll find restaurants. Quite convenient. Friendly security people at the lobby who goes out their way to assist people. But, what really wowed me was the view i had from my room.. I pay twice the money just to have that view of Makati and the Sycip Park below. Sipping coffee at the veranda looking out into that view was way worth the money i paid. I will definitely be back. Thank you so much alcoves 12 at greenbelt radissons. Customer service is lit. They allow me to check in as early as 11am. And really really nice location. Greenbelt 1 is just a minute walk away. The location and surrounding is safe. Definitely come back. 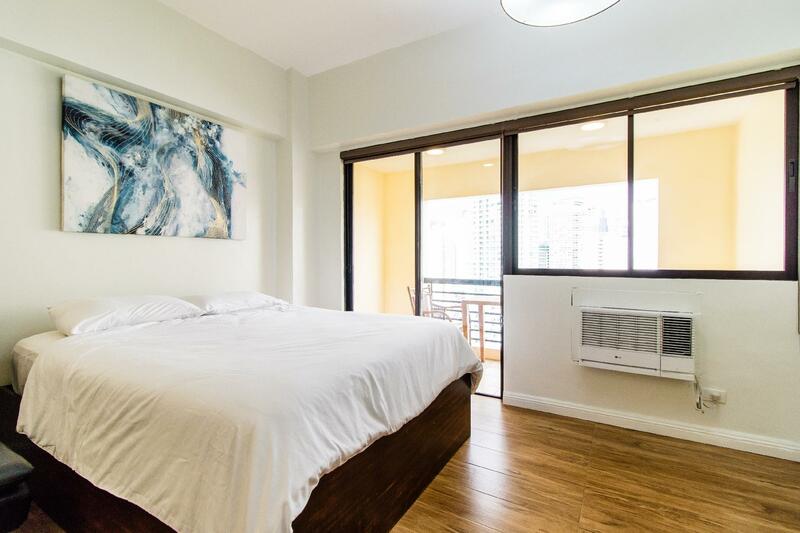 Absolutely great location, very quiet area, bed was fairly comfortable and it is quite cheap for Makati Greenbelt area but that's probably where it ends. The room 8C had an awful smell, sometimes damp but at times like sewerage. Apartment is very run down. Electricity points are coming off the wall exposing wires which I am sure is a security hazard. The balcony door couldn't be locked which made us a little concerned. Unlikely but someone could have climbed up and in from the floor below. Toilet became blocked after a couple of uses so by the second night we were going outside to find other toilets. We asked the hostess waiting for us if we could leave our luggage at reception for a couple of hours as we had a late flight. She was not aware if this was possible (as it is an apartment rental, not part of a hotel) but said she would get back to us but never did. Overall it wasn't a pleasant experience. If it's just a one nighter as a stopover then it might be a good option. Really good location: very close to Greenbelt (5 minute walk) and the airport, and very good value for money. 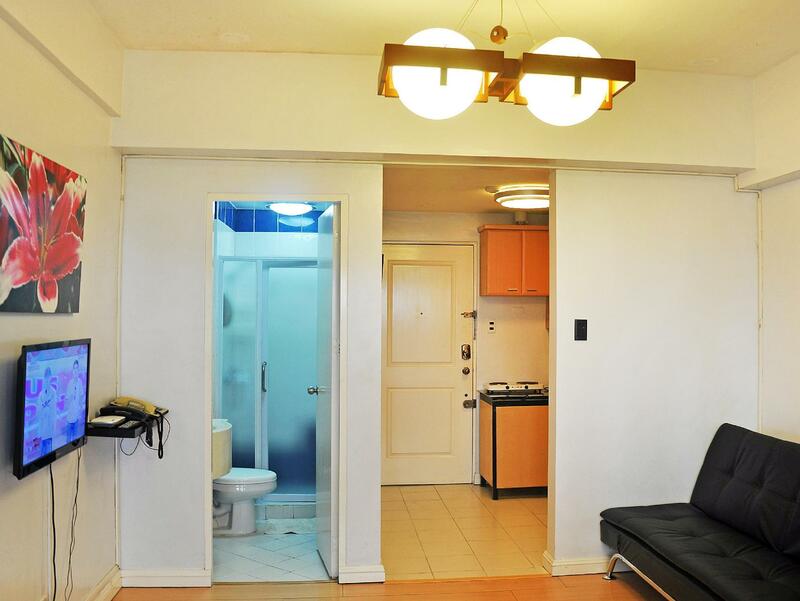 It's a condo unit in a modern tower block, with good WiFi, good TV, a well equipped kitchen, and an adequate bathroom. Recommended for a long stay (over 4 days to a few weeks), as you can make it feel like home. Nice. Perfect location near to everything. Our 2nd stay. 1st stay was definitly a lot cleaner new bed sheets. 2nd stay bed sheets seems to be used bed has a lot of hairs and has smell. But unit has a complete kitchen sets. Superior very friendly and helpful service by the Radisson's Staff. Was somewhat disappointed not to meet and talk to an Alcoves representative, as I was interested in obtaining a possible purchase of a Radisson Unit. Would like to be informed if Alcoves 9 Radisson Unit 21B is listed as a selling unit and the cost? I was in Unit 28E. It is a studio. It was very clean and comfortable bed. The water had strong pressure and hot. The aircond was very cool. The bed and bed covering were very soft and comfortable for sleeping. The view was very nice and showed the gorgeous city night lights. The kitchen had a refrig, stove, microwave, & small toaster oven. Everything was nice. The Greenbelt Mall 1 & 5 are located just 5 minutes walk away. The Alcaves group is a very professional group of people. I highly recommend using their services. We enjoyed our stay. The unit was old but it was very clean and spacious. It had all the basic necessities a travelling family might need. Plus the view from the balcony was beautiful and relaxing. The Alcoves team were very accomodating and well organized. I'd most likely consider going back there in the future. This studio room is at high floor and good location that is near the Mall and Department Store. The condo was the second one we rented while we were in Makati. Initial thought when we entered the unit was, "so bright and clean!" Definitely a newer unit, although smaller. But good enough for a family of 3-4, esp with smaller kids. Somebody was in the unit waiting for us to show us around and give the rundown of the unit/rules/policies. It had complete small kitchen appliances as well as utensils. The couch could turn into a pull out bed, which our son used (& loved lol). The bathroom was clean with sufficient warm water (for those of us who are used to taking warm/hot shower). The BONUS was the cleaners that came every other day at no extra cost. There was also a laundry shop conveniently located in the 7th floor (unit is in the 21st). Everything was within walking distance -- convenience store (Mini Stop), massage places, Glorietta/Greenbelt, Landmarl, Starbucks, fast foods, and restuarants. Worth the money and definitely.would recommend! Where do I start? This is not a hotel but more of a Airbnb type of place. 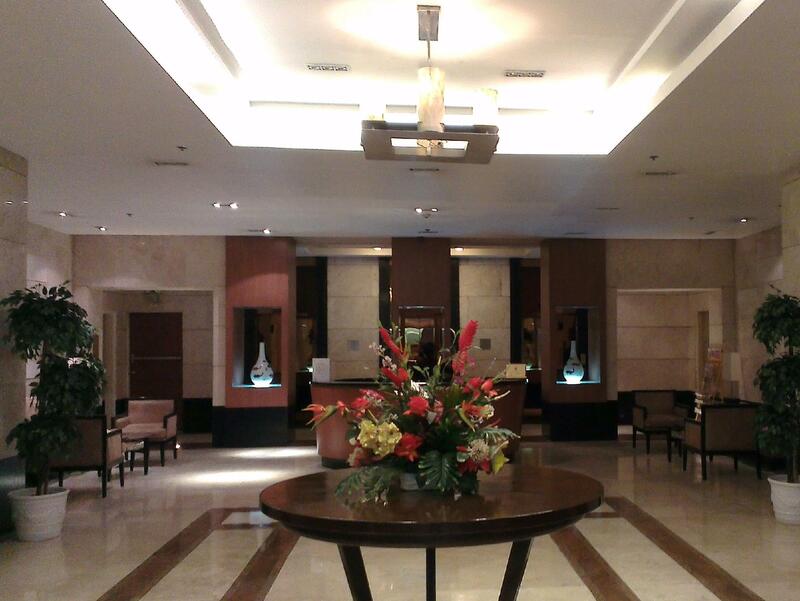 The lobby and halls look great, yet the room itself was a propped-up old room with a bad paint job and old furniture. The bathroom sink was dirty and old, and the water pressure of the faucet was weak. The TV reception was poor, too. The place has a kitchen and utensils to use and an outdoor balcony with a view of the city, and is within walking distance to Greenbelt Mall, but I certainly won't recommend this place. Seems like someone who owns a condo just rents this out. I spent only one night (layover) in Manila but my stay at Alcoves Apartments has been absolutely sensational. Location is great and very close to the bright and fun Manila's nightlife. Personnel (reception/security) available to help as much as possible. Overall...an A+ stay!! It was nice stay in this apt. The only one thing i would sujest other guests that taxi drivers do not know "alcoves apt", you should tell them "go to radisons on aguirre", otherwise, you will go around and never find this apt. very nice place to stay. staff were quick to reply and go out of their way to help. only problem is the apartment is located in a residential building, so building staff are NOT hotel standard, ie, no customer focus - the 'apartment staff' are located somehwere else and come when required. also no resto or food outlet (so no breakfast) but room has full kitchen and utensils, so not too bad. Pathethic and troublesome. the bed squeaks so much of noise and the cleanliness needs attention. sometimes, the cleaning is not done at all. initially, the house-keeping representative will ask you for a convenient time for the room to be cleaned but sometimes they never follow your given time and they might show up at the door early. this causes inconvenience to your privacy and disturbing you while you sleep in. this place is not a guest friendly hotel. the night shift guard at the front desk is arrogant and he will prevent you from inviting your own guest to the room and insists on your guest to deposit their ID at the front desk. no breakfast. front door lock is another issue. there is no secondary lock on the door. the door is just a keyless numeric keypad which comes set as standard. anyone could just enter into your room at night and take your belongings while youre asleep. unlike a similiar apartment nearby, where the door has 2 deadbolt lock and 1 keycard and locking and they also provide breakfast to your doorstep for the same amount. I do not understand how or why the place was stinking like someone smoked and peed in the room (could be the person that stayed before us because none of us were smokers) despite good reviews of cleanliness about this place. Room needs renovation (e.g. floor vinyl near the window/balcony is detaching to the surface, wires near the socket behind the sofa bed is exposed) BUT on the good side of things, T&B was looking good. Kitchenette was very handy too. Our over all stay wasn’t the best, to be honest. Please improve the room. The people in the building wasn’t the best too because our car got clamped by MAPA; guards disclaimed and we never got informed of this before all the fuss happened. We ended up with all the hassle of paying for the penalty fee and got ticketed too. I understand they are not affiliated with the team but was a part of the experience. So to future guests, no parking is included and don’t park at the street side parking if you’re staying here.